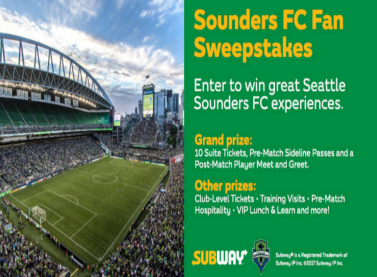 Subway® Sounders FC FAN Sweepstakes – Win ten Suite Tickets to a Subway® Sounders FC Fan Game & more! Win ten Suite Tickets to a Subway® Sounders FC Fan Game & more! ENTER SWEEPSTAKES HERE – Sounders Sweepstakes page. ENTRY LIMIT – Limit one (1) entry for the Sweepstakes Period, regardless of method of Entry. 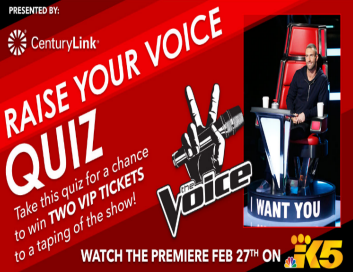 ELIGIBILITY – This Sweepstakes is open only to legal residents of the State of Washington, who are 18 years of age or older at the time of entry and excludes those who live within a seventy-five (75) mile radius of the city limits of Portland, Oregon, extending into the State of Washington. SWEEPSTAKES ENTRY PERIOD – Sweepstakes begins at 12:00 a.m. PDT on August 21, 2017 and ends at 11:59 p.m. PDT on September 17, 2017. Training visit for ten (10) guests at Starfire Sports to view the Sounders & meet the players afterward. -Ten (10) Sounders Club Level Tickets to Subway® Sounders FC Fan Game. -Ten (10) Sounders Pre-Match Loft Access seats. -Sounders VIP Lunch & Learn for twenty (20) people. -Four (4) Sounders Pre-Match Loft Access seats. 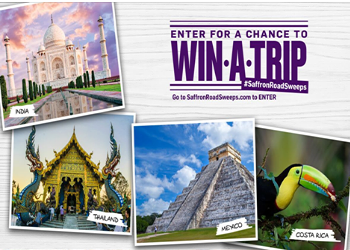 RULES – See sweepstakes rules here (enbedded). Evening’s Best Northwest Escapes Sweepstakes – Win 3 Washington vacation packages! ENTRY LIMIT – Maximum one (1) registration per person. Registering counts as one (1) entry. You will receive one (1) additional entry for every vote you cast. 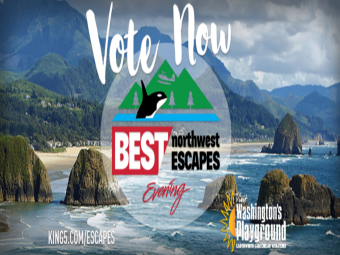 ELIGIBILITY – Evening’s Best Northwest Escapes – Presented by Washington’s Playground (the “Sweepstakes”) is open to legal residents of the State of Washington, Idaho and Oregon who are 18 years or older at the time of entry. SWEEPSTAKES ENTRY PERIOD – The sweepstakes will begin at 7:30PM PT on March 31, 2017 and end at 11PM PT on April 23, 2017. Prize does not include costs of meals not indicated above, ground transportation, gratuities, taxes, transportation, and all other expenses not specified above as part of prize package are the sole responsibility of winner. 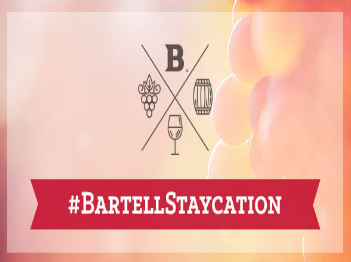 Reservations for lodging must be made a minimum of 30 days in advance and are subject to availability. The trip package has a total approximate retail value of $5,010.00 which may vary depending on time of year prizes are redeemed. HomeStreet Bank Holiday with the Seahawks Sweepstakes – Win tickets to a Seahawks game & more! Win two tickets to a Seahawks game & more! ENTER SWEEPSTAKES HERE – HomeStreet Bank Sweepstakes page. ENTRY LIMIT – Not listed – most likely a one entry sweepstakes. ELIGIBILITY – The Sweepstakes is open to legal Washington state residents who are eighteen (18) years of age or older. SWEEPSTAKES ENTRY PERIOD – The Sweepstakes starts at 8:00:00 AM on November 22, 2016 and closes at 11:59:59 PM on December 12, 2016. Two (2) HomeStreet Bank Suite Tickets to the Seattle Seahawks vs. Arizona Cardinals on December 24 at CenturyLink field. One (1) VIP Parking Pass. Be on stage in Touchdown City while Sea Gals and Blue Thunder perform. 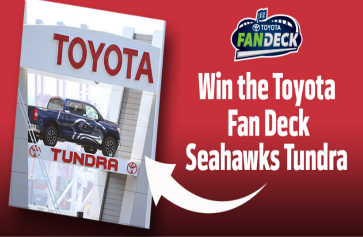 Seattle Seahawks Toyota Tundra Giveaway Sweepstakes – Win a 2016 Toyota Tundra! Win a 2016 Toyota Tundra Crew Cab! Only Washington state residents may enter. ELIGIBILITY – The Sweepstakes is open to legal residents of Washington who are eighteen (18) years of age or older. SWEEPSTAKES ENTRY PERIOD – The Sweepstakes starts at 12:00:00 AM on August 10, 2016 and closes at 11:59:59 PM on December 7, 2016. PRIZES – There will be one prize; one (1) 2016 Toyota Tundra Crew Cab, approximate retail value of MSRP of $41,869.00. Six (6) random drawings will be conducted on December 8, 2016 to determine the 6 finalists. The random drawings will be conducted under the direct supervision of the Seahawks. The 6 finalist will be notified by phone on or around December 8th, 2016 and invited to the December 15th, 2016 game with one (1) guest each to the Seahawks game at CenturyLink Field where the Grand Prize will be awarded. (one of the six finalists will be the winner of the Toyota Tundra). 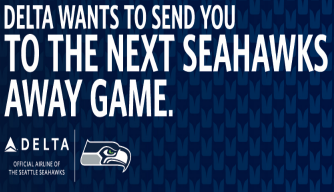 Seahawks Takeoff to Touchdown Sweepstakes – Win a trip to watch a Seahawks away game! 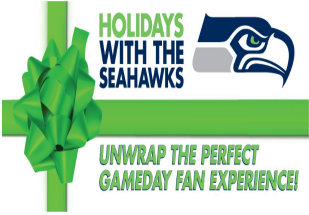 Win a trip to watch a Seahawks away game! ENTER SWEEPSTAKES HERE – Seahawks/Delta Sweepstakes page. ENTRY LIMIT – Limit of one (1) entry per person per day. ELIGIBILITY – The Seahawks Takeoff to Touchdown Sweepstakes is open to all legal Washington state residents, excluding those who live within a seventy-five (75) mile radius around the city limits of Portland, Oregon that extends into the State of Washington, who are 21 years of age or older. SWEEPSTAKES ENTRY PERIOD – The Promotion will be open from September 1th at 12:00AM PST to December 20 at 11:59PM PST. 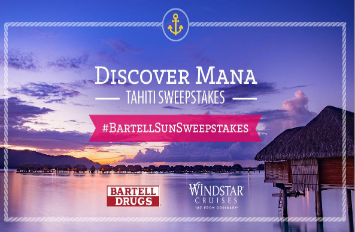 PRIZES – Grand Prize Package to be provided by Delta Air Lines and Delta Vacations. The prize package consists of a certificate provided by Delta Air Lines for two (2) economy class round trip tickets (on Delta Air Lines) to the destinations below, valued at $880 per ticket, a certificate valued for up to two (2) nights of hotel accommodations (standard room; double occupancy) at a participating Delta Vacations property, valued up to $600, and (2) tickets to a Seahawks Away game at one of the below cities, valued from $70 per ticket (prices to vary per game). Winner must book travel by the following dates and travel by the following dates (blackout dates apply).